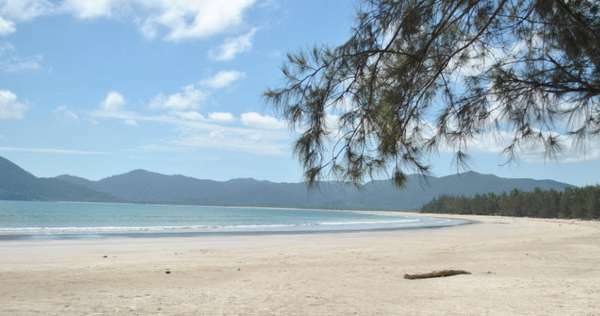 Padang Melang is the beach which has the longest coastline in the province of Riau Islands. The stretch of sand in this beach resort covers up to two regions, Letung Sub-district and Bukit Padi Village, District Jemaja, Anambas. It has eight kilo meters for total stretches. Along this coastline, across the surface is dusted with finely grained white sand. Another charm from this beach is the lanscape with curved like a horseshoe, decorated with thousands of coconut trees lined up neatly and towering pine trees in here and there. Among the pine and palm trees, standing gazebo for visitors to rest, relax and enjoy the ocean views that lie ahead. There are no inns or cottages to spend the night here, if you want to stay, you may stay overnight in one of the houses that surround the beach. To get to the beach is can be reached by motorcycle or car for about half an hour from the city Letung through Letung main street - Kuala Maras. Or it could be reach by speedboat or pompong by sea for about two hours. But reaching through the sea is not recommended, because there is no dock at this beach so it is difficult for landing.